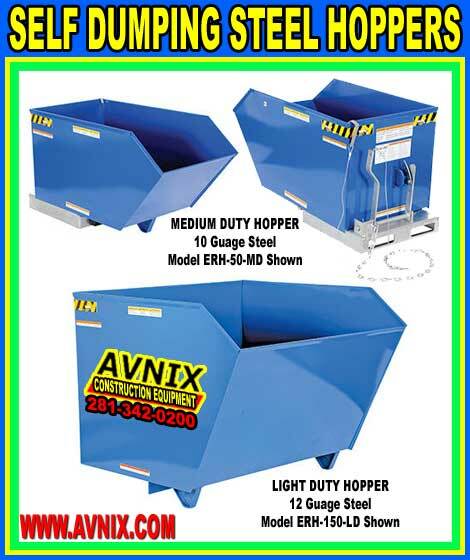 Heavy Duty Self Dumping Hoppers For Sale - In Stock & Ready To Ship! 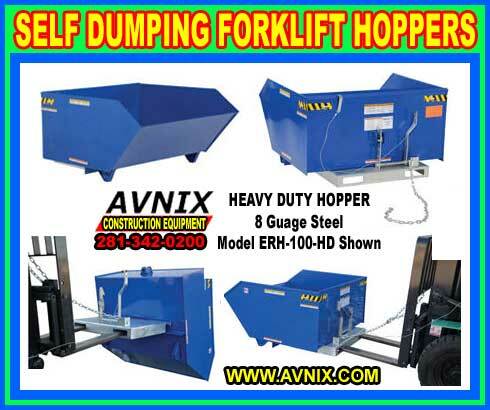 Avnix self dumping hoppers for forklifts feature a full 90° dump angle with a padded rubber bumper stop. The low profile design is necessary for easy loading. Dumping hopper with a forklift is fast and uncomplicated. A forklift operator can pull a cable from the seat of the fork truck to dump the hopper. The hopper returns to an upright and locked position when lowered to the ground. A safety control is provided to secure the hopper to the forklift. 22″ L usable fork pockets measure 7″W x 2″H. Formed base thickness is ¼”. Blue baked-in powder-coated toughness. Must be attached to fork truck when dumping. Self dumping hoppers are manufactured to fit both normal mast and extended reach forklifts. Each of our dumping hoppers offers a fork pocket base that can accommodate forks up to 10” wide and 2 ½” thick. 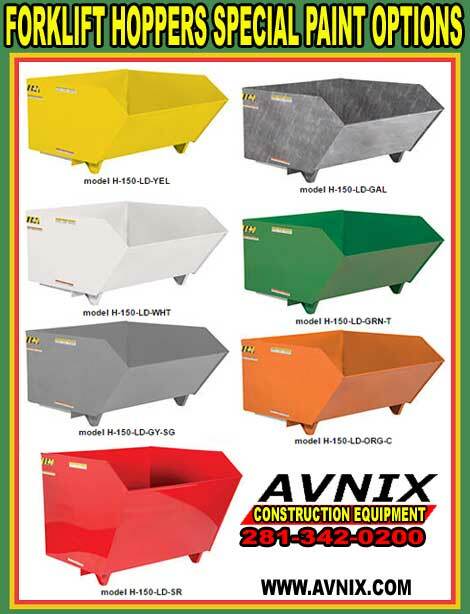 Avnix self dumping hoppers are industrial grade and are designed to endure constant wear and tear in a fast paced, heavy duty production situation. Unlike less expensive units made from thin sheet metal, our hoppers are constructed of ¼” and 3/16” steel plate. This makes our dump hoppers perfect for removing broken up concrete, plaster, brick, particle board, rocks, trash, roof tear off and other debris. Clean up employee’s save a lot of time when they use self-dumping hoppers for any and all everyday jobs related to transporting trash from the building site to the dumpster. The ease of attaching a dump hopper to a forklift in a matter of minutes cuts down the time it takes to clear the job site by the end of the working day, and it reduces the danger of injury when personnel have to physically haul debris to the dumpster. 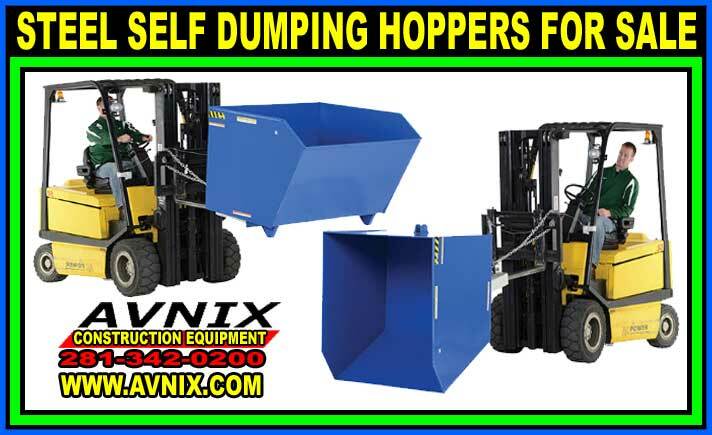 Avnix forklift dumping hoppers are designed with a number of standard features that make them highly multipurpose and long lasting. Each hopper is made with a safety lock that stops the hopper from unintentionally dumping its load when it is jiggled in route over rugged terrain. Self-dumping forklift hoppers also have a rope release that allows the forklift worker to release the hoppers contents when it is lifted. The same rope lets a employee on the ground to empty the unit if needed. Balance and smooth operability are maintained with a safety chain that locks the hopper to the forklift and keeps it from sliding off the forks. A grab hook keeps the chain out of the way when it is not in use.